While there is some indication of a possible link, it’s not nearly strong enough to fuel a narrative casting debt-ridden graduates as a significant economic burden, permanently lowering the homeownership rate. Regardless of the evidence, we still need to monitor student debt’s effects to the best of our ability, given its outsized role in household balance sheets, said Meta Brown of the Federal Reserve Bank of New York. In previous years, borrowers with student loans were associated with better credit profiles and higher homeownership rates among young households relative to their student debt-free counterparts. Now, the relationship is less clear, and those with student debt are slightly less likely to hold home-secured debt (a proxy for homeownership). Holders of student loan debt also have worse credit scores, meaning it could be more difficult for them to qualify for a loan, find housing, and obtain a credit card. If student debt really is hurting homeownership, the panelists agreed that certain types of students are bearing the bulk of the damage. Research presented by Jeffrey Thompson of the Federal Reserve Board found a connection between student debt and lower homeownership almost entirely attributable to students that took out loans but did not successfully attain a degree. Other factors besides student debt are more certainly at play in driving down the homeownership rate, such as changing interest in homeownership and the broader issue of restricted credit availability. 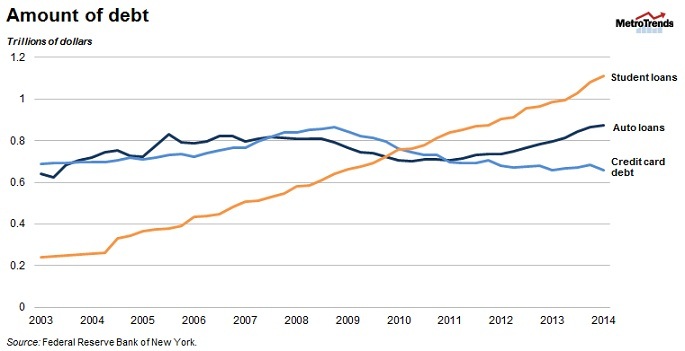 Notably, the homeownership rate has declined steeply for 27-30 olds both with and without student debt. Many of these young potential homeowners have been locked out of the housing market at an opportune time to buy a home due to their inability to meet the debt-to-income ratios required in this tight lending environment. Others have been stymied by low credit scores, which hamper their ability to secure loans for a home. Others still may have decided that homeownership is not the best financial decision at this point. Sandy Baum of Urban’s Income and Benefits Policy Center also critiqued the notion that student loan debt is weighting down the homeownership rate. She notes many student debt measures are flawed because of weak data and questionable assumptions about borrowing patterns. And from the perspective of students planning on taking out loans to continue their education, what is the alternative? Forgoing college is rarely the best long-term financial decision, demonstrated by the well-established earnings gap between those with and without a college degree. Moreover, a large proportion of the borrowers with more than $40,000 in student loan debt have borrowed for graduate or professional school, raising long-run earning power even higher. The mainstream discourse often ignores the nuances surrounding the issue of growing student debt and it’s linked to financial hardship and broader economic woes, suggested Beth Akers from Brookings Institution. 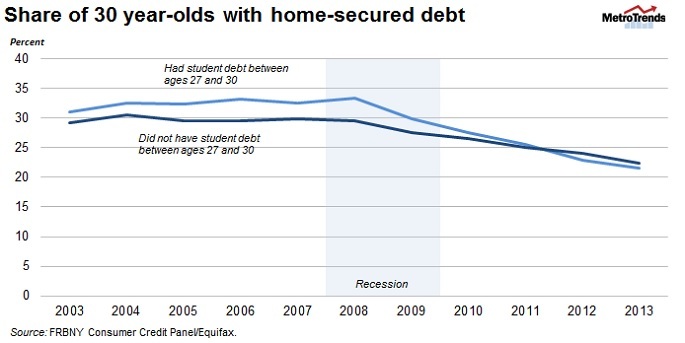 As student loans comprise an increasingly large share of total household debt, expect the conversation to continue. Correction: The original version of this post mislabeled the series in the second chart. The chart plots only 30-year-olds with home-secured debt, broken out by those who did and did not have student loan debt at any time between ages 27 and 30. We originally implied that it showed homeowners between ages 27 and 30. Our apologies.